Bartholomew Falkner's parents are most likely John Faulkner and Hulda Robinson who were married 7 Feb 1781. John Faulkner and his family lived in Halifax district of Warren County until his death sometime after 1820. In the 1800 Warren County, N.C. census, John Faulkner is listed with 1 male (Bartholomew) between 16 and 25 years old, and 2 males (Hardy and Robert) between the ages of 10 and 15. In the 1810 Warren County census, John Faulkner is listed without these three sons and Bartholomew, Robert and Hardy are enumerated for the first time. Each of these brothers were married between 1800 and 1810 and settled in Warren County. Bartholomew married Sarah Clark 7 July 1802 in Warren County, Hardy married Mary "Polly" Clark (Mary and Sarah were sisters) 5 January 1807 in Warren County and Robert married Feraby Roberson 10 Feb 1810 in Granville County. Have you taken the male Y-DNA Lineage Test? Is your surname one of the Faulkner/Falkner/Forkner/Fortner, etc variations. Do you think that your ancestors may have lived in North Carolina? If you have the DNA test results and it shows that you belong to Haplogroup I1, you may be related to the Faulkner's of Sandy Creek. Please contact me so that we may compare results. I would like to compare genealogies and see if we cannot identify a common ancestor. I will not publish your name or DNA results without your approval. Since 1992, I have been researching my Faulkner ancestors. I have been able to document my ancestral line to the birth of my third great grandfather Edmund Faulkner born about 1811 in the Sandy Creek area of Warren County, North Carolina. Unfortunately, I have been unable to identify his parents or any of his siblings. While searching for my family connections, I recorded any genealogical event related to the Faulkner surname including the various spellings of Falkner, Falkener, Falconer, Faulconer, Folkner, Forkner, and Fortner. As a result, I have compiled data on many Faulkner families and their descendents. I have discovered that there are several Faulkner lines that, like my own, have reached a dead end with ancestors born in or near Sandy Creek at the beginning of the nineteenth century. I would like to locate parents for these lines and for my own. It is my belief that most of these Faulkner/Falkner lines are related. 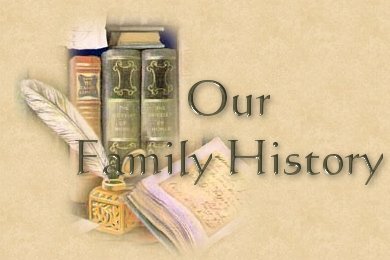 I created this website to generate interest, discussion and a sharing of genealogical data among those that are interested in these family connections. Brothers Emanuel Faulkner and William Faulkner are the earliest known Faulkner's to settle in the Sandy Creek region of North Carolina. Emanuel and William were born in Queen Anne's County Maryland to John Faulkner (born 1678 died 1727) and Sarah Ford (born 1680 died 1731). In 1746, Emanuel Forkner , William Forkner , and John Dickerson (Emanuel's father-in-law), were listed among the signer's of a petition to Governor Gabriel Johnson requesting the formation of a new county. On 12 November 1750, a 400 acre tract of land on the east fork of Sandy Creek was surveyed for John Dickerson. Chain carriers were Emanuel Faulkner and William Faulkner . In October 1754, Emanuel and William are listed on the rolls of Capt. John Glover's Company in Col. William Eaton's North Carolina Militia Regiment. 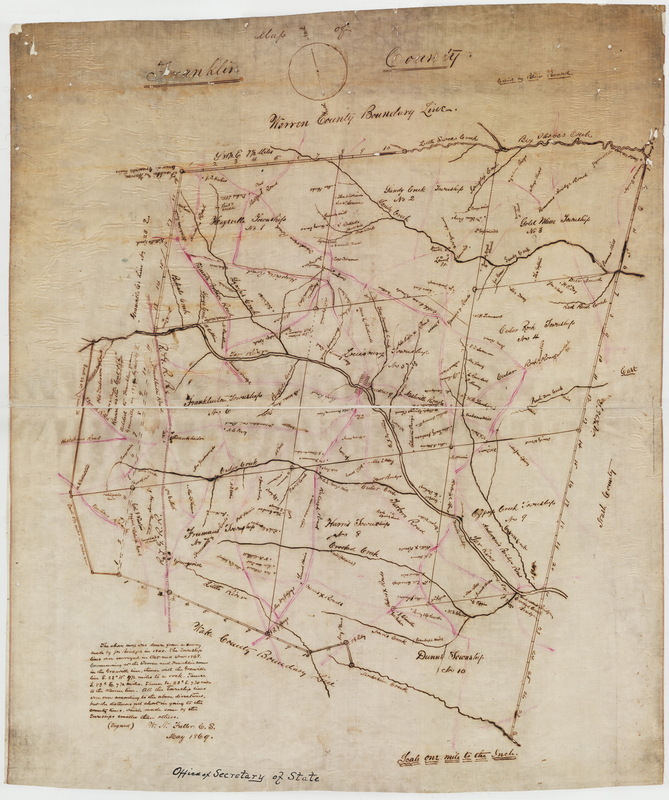 On 3 June 1755, John Dickerson of Granville County conveyed to Elizabeth Falkner, wife of Emanuel Falkner planter, and daughter of John Dickerson the following tract of land. John Earl Granville did grant unto said John Dickerson tract of land of 600 acres on Sandy Creek and Owens line. Now this indenture John Dickerson for natural love and affection to said daughter 100 acres of said tract where Elizabeth and Emanuel Falkner now live. Beginning at Falkners spring branch, John Dickersons line, preserving out of this a water grist mill on Sandy Creek with two acres of land. Witnessed by Henry Thorton and John Bowis. Signed John Dickerson. Most of Emanuel and William Faulkner's children moved westward. Some settled in the western North Carolina counties of Surry, Wilkes and Iredell and then moved further west into Tennessee, Kentucky and Indiana. Two of Emanuel's sons are known to have remained in the Sandy Creek area. They are 1) John Faulkner who married Hulda Robinson in 1781 and may have had at least 6 sons and 3 daughters born between 1782 and 1795, and 2) Hardy Faulkner who married Mary Carter in 1783 and who may have had 3 sons and 3 daughters born between 1784 and 1810. Only five of the potentially fifteen children in these two families have been identified. Please contact me if you have any data that may provide a link to these unidentified children. It is believed that three of John Faulkner's sons were Bartholomew Falkner, born circa 1784, Robert Faulkner born circa 1785 and Hardy Falkner born circa 1790. Each of these sons are known to have had a number of offspring that have not yet been connected to their parents. Bartholomew Falkner married Sarah Clark 07 July 1802 and they had ten sons and four daughters. Only three of the sons and two of the daughters have been identified. Robert Faulkner married Feraby Roberson in 1810 and they had at least three sons and three daughters born between 1811 and 1825. Hardy Falkner married Mary "Polly" Clark in 1807 and they had four sons and three daughters born between 1808 and 1820. 1746 - Granville County was formed from Edgecomb County. 1764 - Bute County was formed from Granville County. 1779 - Bute County was divided into Warren and Franklin Counties. Bute County no longer existed. 1881 - Vance County was formed from parts of Franklin, Granville, and Warren Counties. Faulkner's have been living on or near the stream or creek named Sandy Creek and in the surrounding Sandy Creek Townships for over 250 years. 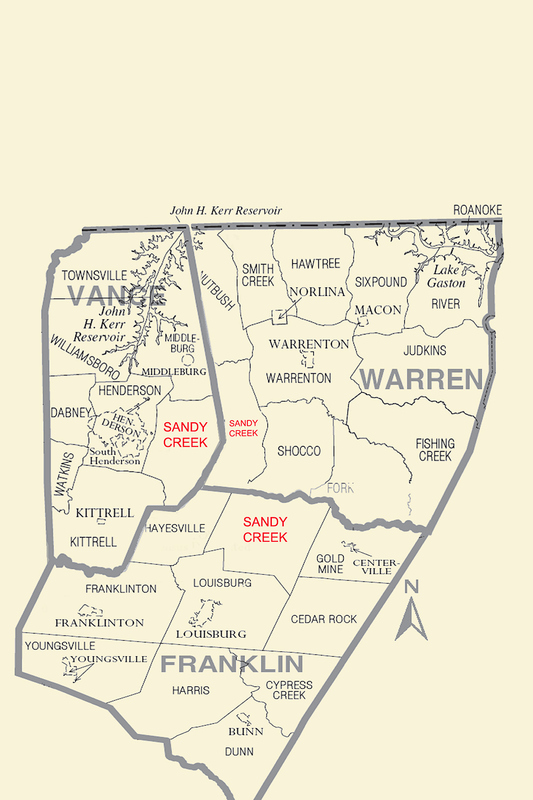 Both Warren and Franklin Counties had adjoining townships named Sandy Creek before Vance County was formed in 1881. 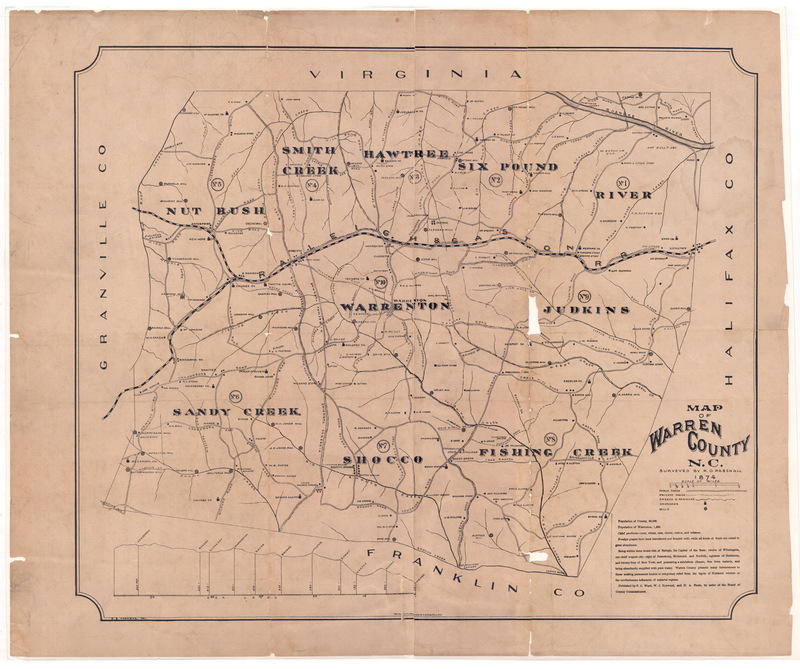 Map of Warren CountyNorth Carolina in 1874 showing each Township including Sandy Creek. Map of Franklin County North Carolina in 1869 showing Sandy Creek and other Townships. Map of Vance,Franklin,and Warren County North Carolina after the formation of Vance and showing Sandy Creek and other Townships. The origin of the name Faulkner is English, Scottish. Derived from the Latin word "falco" meaning falcon. 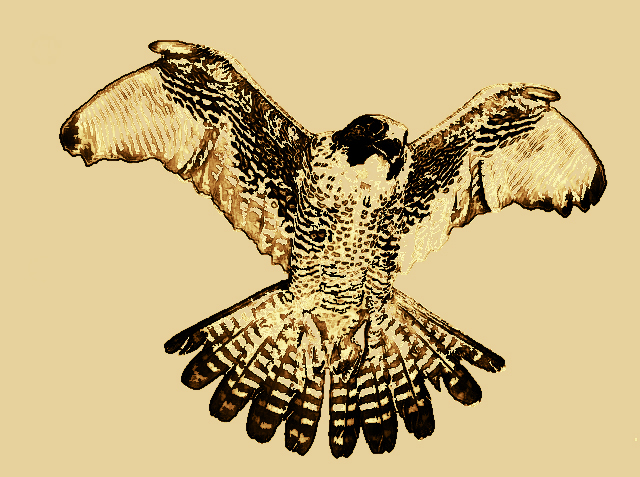 The name was given to those who kept falcons for a lord or to those who operated a weapon named for the bird. Among famous bearers of the name are Charles James Faulkner, Sr. (1806-1884) of present day West Virginia (then Virginia) served in Congress and as minister to France before the Civil War and as a staff officer to General T.J. Jackson in the Civil War. Charles James Faulkner, Jr. (1847-1929) of present-day West Virginia (now Virginia) was a senator from W. Va. who was responsible for the law against food and drug adulteration. Barry Faulkner (1881-1966) of New Hampshire was an artist who specialized in murals. William Cuthbert Faulkner (1897-1962) of New Albany, Miss. was born with the surname Falkner. He won two Pulitzer Prizes and a Nobel Prize for Literature. 1. Living People: The website will classify a person as Living if they are less than 110 years old and do not have a date of death. Only the name of the individual will appear. 2. Surname Spelling: The spelling of surnames, and given names, are as they appear in the records. However, in some cases, such as the Faulkner/Falkner variations, I have attempted to spell the surname as descendents have decided to spell it. If the spelling of your family surname, or an individual's given name, is not correct, please let me know. 3. Dates: I have estimated a number of births, deaths and marriages. If the date is unknown, I have either left the date blank or made an estimate to place the event within an approximate timeline until the exact date may be determined. An estimated date will usually appear preceded by “circa” or “about”. 4. The ancestors of William Cuthbert Faulkner: William Cuthbert Faulkner's ancestors have been traced back to William Joseph Faulkner in Surry County, North Carolina. However, making the assumption that William Joseph Faulkner's father was Joseph Forkner, son of William Faulkner is pure speculation on my part. A number of genealogists have suggested this connection but to my knowledge it has not been proven.